It must be the New Year and everyone's new organization and planners that have me eyeing all of these super pretty notebooks. The cold (another snow day) and having not much to do makes me want to curl up and write lists. I'm a huge list maker and even if it's not a to-do list, I make lists for absolutely everything. And somehow, I've become this shopping addict (or rather, have always been one, I just discovered the beauty of online shopping) and feel the need to order everything. I mean, the J. Crew factory sale the other day and then the Lilly sale yesterday morning (which I woke up at 7:50 for and then went back to sleep until 12 for #NoShame) and my wallet's a-hurtin'. It won't keep me from 'browsing' though, right? A girl's gotta love her polka dots and pinks. The Sugar Paper journal is SO cute. I always need a little notebook to write my To Dos lists in, and this might be top on the list for my next one! Rebecca, it was actually your Instagram photo the other day that got me thinking about how much I wanted a new notebook! Ahahah. But yes, the Super Paper one is just adorable!! I love all of these! 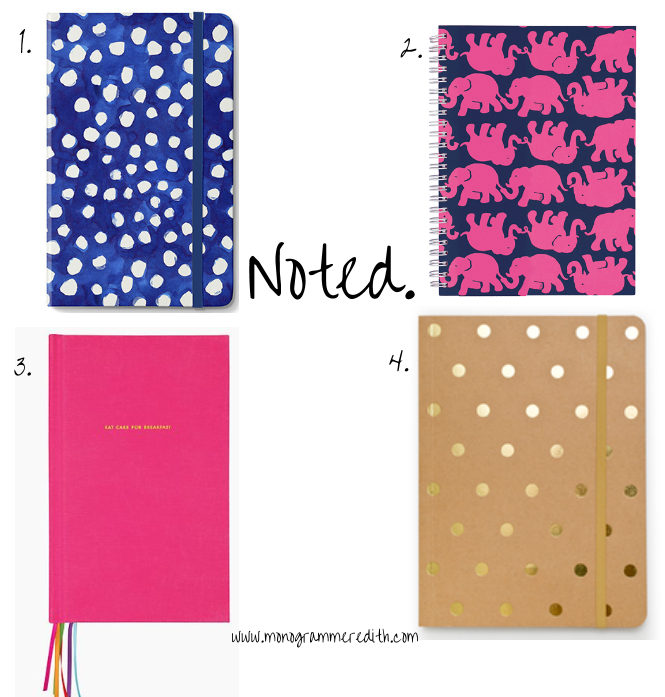 The elephant one is my favorite. I always look at TJ Maxx for cute notebooks. They have the best ones! Such a good idea, I'll have to look there! !